Summer and winter, Kilmacolm members are attending instruction rallies. This is the backbone of the club and there is something on every week, sometimes more than one! We have the use of 2 lovely outdoor schools and in winter we have some of our rallies indoors at Ingliston House. There is something for everyone and only the best is good enough for us so we have top class instructors. We have regular instruction in dressage and show jumping and as was said earlier, cross country, especially in spring and autumn. There is also a thriving Prelim Group which is popular with those whose main aim is to have fun. Sometimes this is used for introducing young horses to the big wide world. We arrange occasional meals together and last winter had a brilliant fund raising ceilidh but probably the main social events take place on the roads around Kilmacolm where riders meet and chat and hold up the traffic! 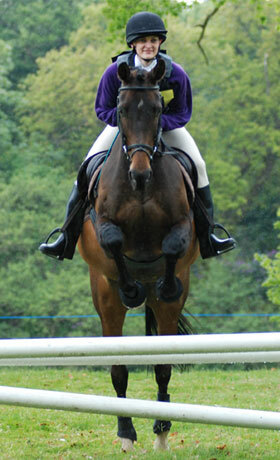 We hold open competitions in dressage and show jumping and also smaller ones for members only. We also try to put teams together wherever possible to go to competitions held by other clubs and to the Area competitions. You don't have to wait until you are the great and the good with Kilmacolm Riding Club - if we can get 4 people who want to go, we'll enter a team. This approach seems to have paid off with a lot of people having a lot of fun and a surprisingly large haul of rosettes over the years for quite a small club. For information regarding joining or if you are a new member please e-mail . Membership forms can now be found on the Members Info page.